Over on our popular questions and answers site Lockergnome.net, bcgocubs asked how a computer will benefit when using an SSD. Also, they would like to know what everyone’s general opinions are regarding solid state drives vs traditional hard drives. A traditional hard drive has moving parts, but is quite inexpensive compared to an SSD. The solid-state drive is just that: suspended in a solid state with no moving parts. It may be more expensive to buy one of these, but many people are starting to believe that they are much better for your computer. What are your thoughts? 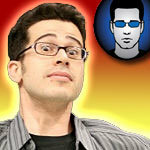 Chris Pirillo: What is Bloatware? A caller the other night asked simply: “What is Bloatware?” That’s actually an easy one to answer! Bloatware is when you have a piece of software that should be a certain size. However, due to several unnecessary things being added in, the size of the software increases dramatically. Heck, sometimes companies add so much crap in that the original software ends up being buggy and laggy. I love USB. I love the ports, the devices and the hubs. The problem with hubs, though, is that most of them top out at only seven little spots to plug things into. I have SO many USB devices. How the heck am I ever going to plug them all in at once? How many USB devices do you have? List them all in the comments thread and let’s see who has what! Whoever has the most (and can PROVE it with a picture of them all together at once) will win my existing USB hub! Chris Pirillo: Should You Quit Facebook? Are you leaving Facebook? With all of the concern over privacy lately, many people are choosing to close their accounts. Others are educating themselves with the changes Facebook has made and making the best choices for their profile pages. Still more people are clueless… they don’t realize what is being shared and with whom. They have no idea how to fix this problem once they do learn of it. They just keep going along with their heads in the sand, and hope for the best. This isn’t the way things should be, folks. You shouldn’t have to be so afraid of what the wrong person might see. The fact is, if you put something online then someone will see it. I have come up with the perfect two-step plan to help solve this problem.